St. Louis Testing Laboratories, Inc. is a privately owned, independent commercial testing laboratory performing analyses, testing, inspection, in the specialized fields of Nondestructive Testing, Metallurgical Analysis, Mechanical Testing, Organic, Inorganic, Environmental, and Chemical Analyses. Since its founding in 1929, St. Louis Testing Laboratories, Inc. has continued to expand into new testing fields; always with one goal in mind...to set the standard for quality. See our Contact Us page for a map and link to driving directions. For current career openings, please contact us. 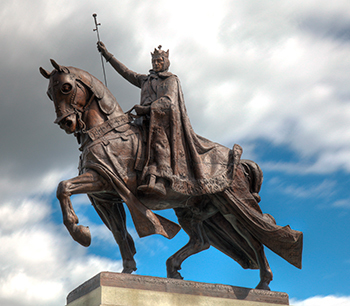 Apotheosis of St. Louis is a statue of King Louis IX of France, namesake of St. Louis, Missouri, located in front of the Saint Louis Art Museum in Forest Park. Prior to the completion of the Gateway Arch, the statue was the principal symbol of the city. It has served in the iconography of St. Louis for more than a century.